These are some small cranes and flapping birds. The three on bottom are flapping birds. I had some bigger ones in blue, one with curved wings and one with straigh ones but they were ofered to a friend. The two on top are cranes. These cranes and birds teach you two basic things in origami: the bird base and the petal fold. If you have enough time you can do 千羽鶴! A senbazuru/ 1000 cranes is mostly used as a gift for a wedding or for a sick friend. Whatever your case it greatly shows that you care about that someone. There are lots of available kits for senbazuru. You can also Google for Sadako’s story and her relation to 1000 cranes. You can learn how to fold them in a senbazuru kit. For basic folds go to Origami Club basic folds and tecniques. 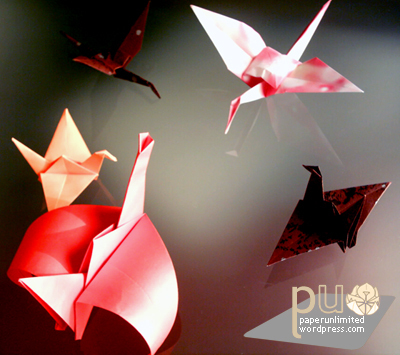 At Origami Club you can find a traditional crane diagram (don’t flap wings) as well as some color variants such as two white and red cranes: one with one side red and the other white and one with it’s tail white and a red head. For a flapping bird try Origami for Everyone. You can also fold a cube (waterbomb base). Good luck with your folds! This entry was posted on 2007|01|27 at 18:47 and is filed under origami. You can follow any responses to this entry through the RSS 2.0 feed. You can leave a response, or trackback from your own site.